Well, I thought the old "Shambling Toward Affordability" title for this series of articles was a bit pithier but it just doesn't quite work now that home prices have been rising for the better part of a year. 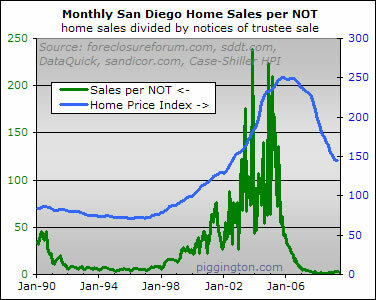 In any case, regardless of the what we want to call it, it's time to check in on San Diego housing valuations as of year-end 2009. The 2009 home price rally reversed the direction of the shamble, but it didn't really change the overall picture, which is that San Diego home prices (in aggregate, of course) are still at middling levels of valuation. Some have asked what distinguishes a Data Rodeo from a Chartfest or for that matter the rarely seen Chart Extravaganza. The answer, which I will fabricate as I type this sentence, is that Data Rodeos are reserved for the monthly roundup of resale data, whereas the two alternate names are used for generic chart collections based upon the levels of extravagance and general chartiness contained therein. 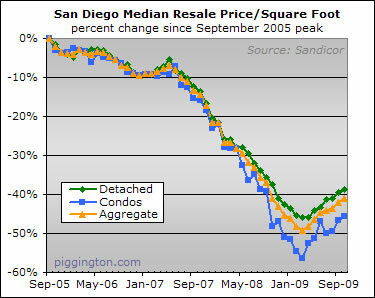 The rally in San Diego's median price per square foot continued through September, with the ppsf rising 2.2% for detached homes, 5.5% for (much more volatile) condos, and 3.1% for a volume-weighted aggregate. Reset Timebomb Not Such a Big Deal? I have long suspected that the whole "reset explosion in 2010 (or thereabouts)" factor was a lot more complex than people often make it out to be. 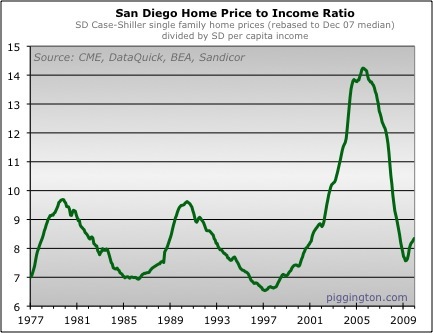 Especially for San Diego... we are at the forefront of the bubble on the way up and then the way down; it makes sense that our reset peak might happen earlier as well. But there are bigger reasons than that to doubt the reset explosion thesis. One is that resets don't matter -- all those loans were written at a time of substantially higher short-term rates, so a simple reset to the prevailing market rate should actually lower the mortgage payment. Recasts, not resets, are the danger. Recasts occur when the borrower starts paying down principal on an interest-only loan (in which they've paid only interest, as the name suggests) or a negative amortization loan (in which they haven't even paid all the interest, resulting in a principal that's been growing since they took the loan out). Option ARMs would fall in the latter category, assuming that the borrowers had chosen to take the "option" to pay less than the full payment amount. It's time for a little update on the long-term aggregate housing valuation charts. 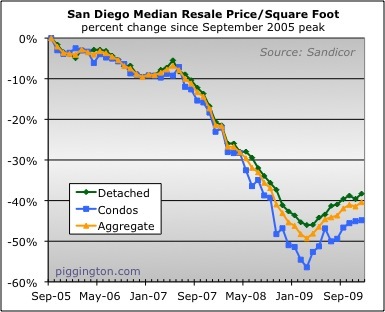 (The emphasis is on the word "aggregate" -- let's just get it right out of the way these charts are based on a single home price measurement that encompasses the high end, the low end, and everything in between). To sum it up, we've gone pretty much nowhere since the prior checkup on these numbers as of December 2008. The home price-to-income ratio had dropped further in the early part of the year, but rising home prices and falling incomes have combined to nudge the ratio back up in recent months. Ramsey Su: Has Real Estate Bottomed? Well, we sure do appear to be having a good old fashioned spring (and now summer) rally.